Last night we continued our evening otter watching vigil. We discovered a possible pattern of an otter or otters emerging between 8.30pm and 9pm at a particular site. Obviously I’m preferring them to be earlier to catch some light for photos! 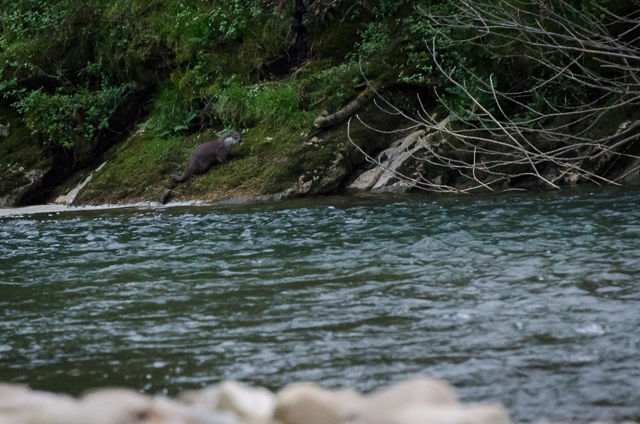 After 30 minutes we spotted an otter further up river on a grassy bank, it appeared to have just caught a lamprey. Although at least 80m away we could make out the lamprey thrashing around but still in firm grip of the otters teeth. Watching intently we wished it was closer and hoped it would make its way towards us. However, with such a large prey it would be eating for sometime. With the light failing we were ready to head home, then to our left 2 young otters exited a cave that we had suspected was a holt or resting place for sometime. They bounded along the riverbank chasing each other, dived in and out of the water for a few minutes and then disappeared. It was incredibly noisy and bustling compared to the silence of the previous 2 hours, quite a moment. Walking home we again spotted an otter swimming slowly, hugging the far bank on its way down river but soon lost it to the dark. Unfortunately no decent photos this time as the dark had descended but here is a grainy shot as proof.